Triple A is a fresh name. But these artists are more Major League. For those that don’t know Woes was the Employee of the millisecond at Borders. Nah, he and my homie Kawika was my caffeine providers. So next time you robbin’ Borders by reading every mag and putting it back in the wrong place, spock out the Trip A’s. Word to DJ Bone. If there was an event like this when i was in college i would be there religiously, iching for the open mic. Siq, KTUH, GotRice. Nice. Authorities said the group is responsible for some of the city’s most notorious acts of vandalism, most notably L.A.’s largest tag: the giant, half-mile-long “MTA” scrawl that appeared last year along the concrete banks of the Los Angeles River near downtown. The Starfish guy got his solo show goin’ down. Good to see homies get theirs and create. Support local artists of all genres. Chocolate thunder! “Sleepers” 40% off & H(art) show. First, Mahalo to all that supported the Pop-Up store and making it a success. We still got a bunch of sizes left, so if you never bought one, now its your shot! Use the word SLEEPERS when you check out and get %40 off each shirt you buy. We gotta make room for spring/summer and we wanted to hook up the peeps that couldn’t make it out or neva have much loot. Also we wanted to say we will be Pulling the name out for the winner of the ANGRYWOEBOTS X LIGHTSLEEPERS skateboard deck. Hopefully this week. So if you bought a shirt you could be the lucky one. *sidenote* we might not get MF DOOM, sorry. Wade got a event goin down should be fun for all. Free. DJ mems, Nabahe, Fatsoul, Koak. and friends. Check the tube for mo’ info. Blue Hawaii presents: STAY GOLD, featuring the works of MOE RADKE and TES ONE! With DJ NAK on the wheels of steelo. Guest artists: Jerk, Skech, MyCryptonauts, 14400, Jon Radke, and Woes. The OPENING NIGHT is Invite only so get at me ASAP! All Lightsleepers heads welcome. 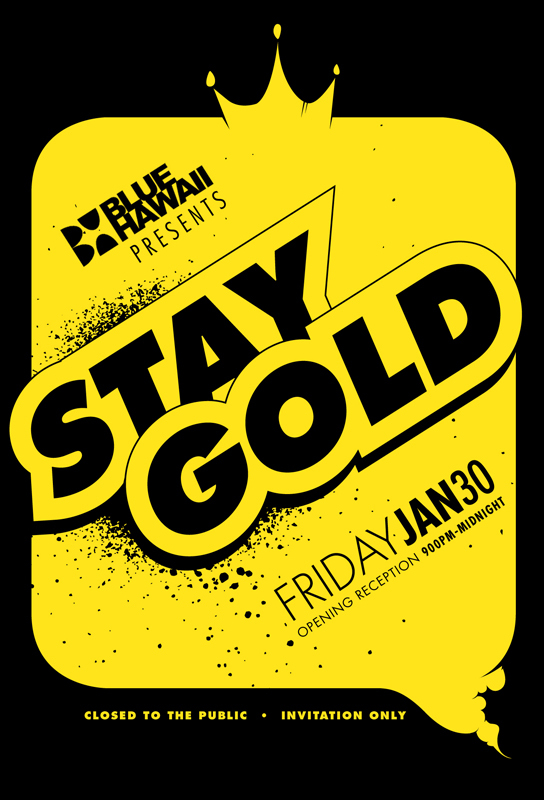 STAYGOLD @ Blue Hawaii Kalihi. 9pm to Midnyte! lightsleepers@gmail.com to get on the guest list. The crew at Atypicalliving is hosting this art show @ Starbuck-buck-buck of all places. Most likely the first of its kind at Starbuck-buck-buck and in Ewa Beeeeatchhhh. Its free and there might be some caffeine boostas for ya tired ase!